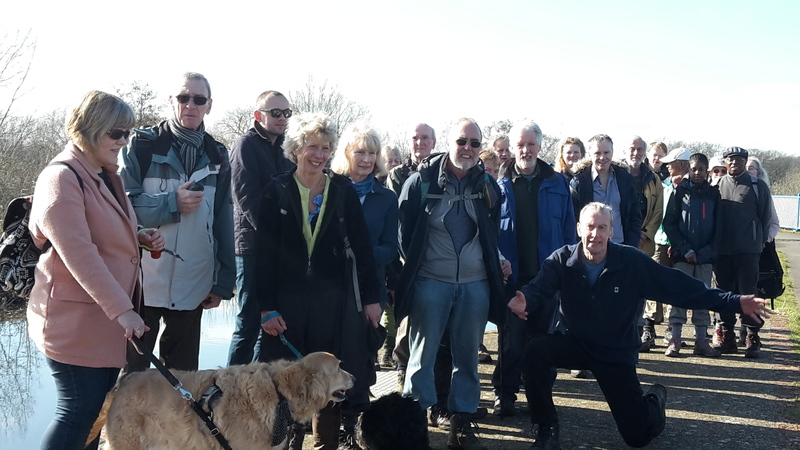 On Saturday we were greeted with clear skies and a lovely morning for the first of this year’s walk programme. 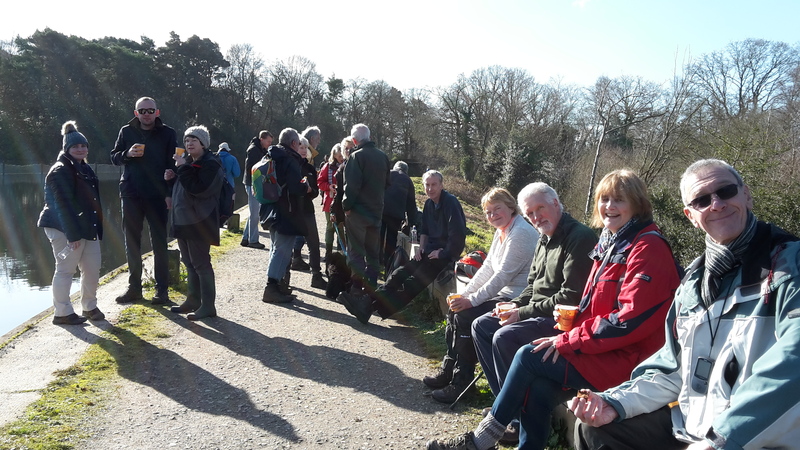 Thirty of us met at Lakeside Park for a six mile ramble which used to be a straightforward walk up the river to North Camp and back down the canal. However as you know the river path is now diverted to now follow Hollybush Lane, so once again I took the chance to show everyone my alternative route on the west of the A331 and my path discoveries after last year’s towpath closure on the canal. We walked to the river, crossed Lakeside Road and headed north, a red kite circled over us as we climbed up onto Hollybush Hill. I briefly explained the progression of the area from landfill tip to wildflower meadow before we crossed over the road to Ramillies Park Estate and onto Marlborough Park. Those near the front were subjected to my potted history of the connection between the names, including a brief summary of small Belgian villages and the War of the Spanish Succession and the Churchill family. I think I understand why some walkers stay resolutely at the back! Anyway we pondered about the avenues of grey poplars along the former recreation site while we waited for all to catch up. We crossed back over the BVR via the pedestrian bridge before crossing Carrington playing fields and on to the canal. We had refreshments while we sat on the boards overlooking Mytchett Lake, (I particularly liked the strawberry and chocolate sponge cake and pleased no one else spotted it). We then turned south along the canal before diverting to the other side of Greatbottom Flash and watched the army activities on Steel Hill firing ranges. Then it was back to the canal and onto the aqueduct before wandering back through Lakeside Park. We did this walk last year in July and it was noticed how different the scenery looked with vegetation much more sparse the views were more open and not a bit of Himalayan Balsam in sight! I hope all enjoyed it whether they were seeing these paths for the first time or were familiar with the area and will again accompany me next month. This entry was posted in Access, Events, Lakeside Park, Wildlife and tagged BVCT, Hollybush, Lakeside, walk. Bookmark the permalink.